Recently Cathy A paid the studio a visit. It was lovely to get in touch and catch up on the news. She is the former owner of the Beary Important Shoppe, a founder of the Bearfanatix club and annual teddy bear competition, and a teddy bear maker, designer, and teacher of note. Although Cathy promised never to stop making bears, after closing her shop her new life swallowed her up and we hardly ever saw her. 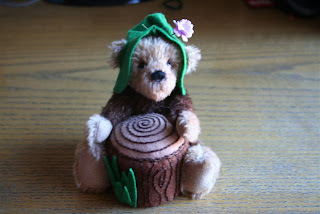 A pin cushion sewing competition has prompted Cathy to get back to bear making, and here are the results of her endeavour. Sabine is a wood elf with a tree stump pin cushion. You will find her pattern in my Etsy shop. 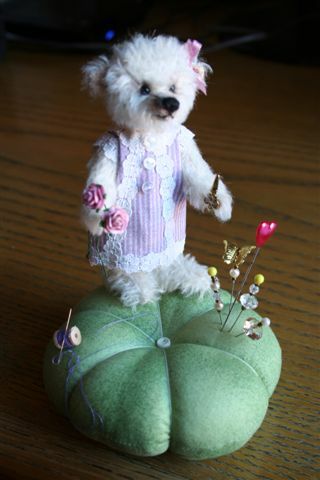 Muffy is a prim little lady, standing on a pin cushion. You will find her pattern in my Etsy shop. Well done, Cathy! It is lovely to have you back. I love the standing little bear. What a pleasure to sew with this bear minding your pins. Yes, one needs someone to guard the sharp stuff sometimes! If I could, I would have a bear on everything.